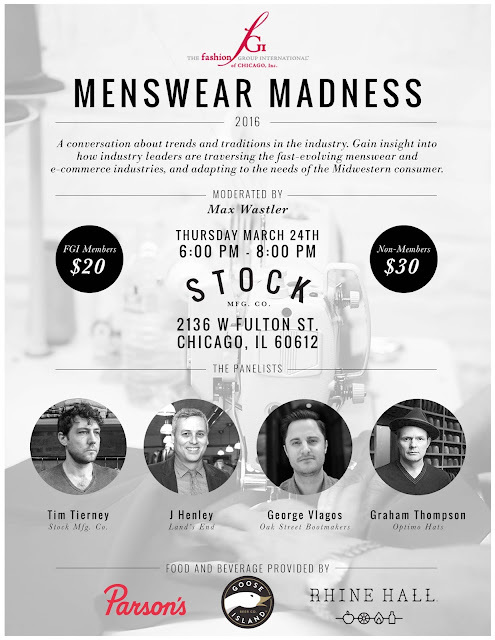 Menswear Madness with FGI of Chicago! Fashion Group International has some great monthly events in the Windy City. This month, the gents will get their chance to shine with a swanky panel on menswear trends and traditions. On March 24, 2016, be there to hear the latest, and enjoy a fun evening of fashion and socializing. Be sure to check out Stock Mfg. Co. online, too! Quality goods made in the heart of Chicago. Labels: Chicago, clothing, fashion, Fashion Group International, fashion trends, manufacturing, men, menswear, smooth gentleman, Stock Manufacturing Co.